It was quite the weekend in Downers Grove's Randall Park neighborhood! Take a look at this idyllic, family-focused neighborhood where so many of our clients live. When clients come to us looking for help to identify a property to build their dream house on - we ask a lot of questions to understand what type of neighborhood is a good fit with them. Many of our clients happen to be looking for the same thing; a family-friendly neighborhood, walk to town access, great schools, parks nearby and a strong sense of community. Randall Park, a small neighborhood tucked in Downers Grove, is one that we often point clients to because it checks so many of those boxes and more. This weekend was one for the record books in this neighborhood and reminded the residents why they love living here so much. 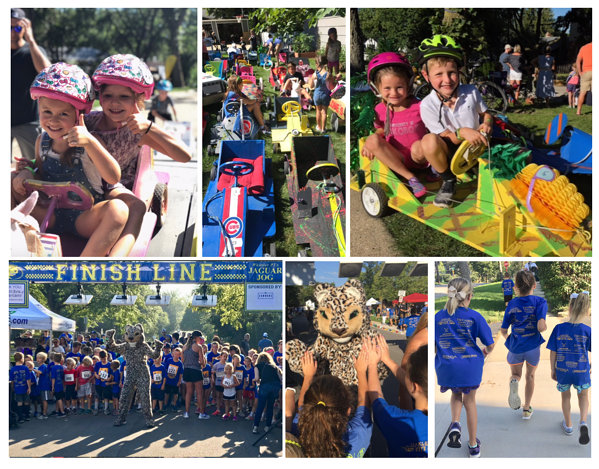 With the annual Soapbox Derby run by some fun-loving, hardworking neighbors and a school fundraising race benefitting District 58's local Whittier Elementary School - this neighborhood came alive! Over the years, we have built and remodeled over 20 homes in this few block radius and some of our own team members live here as well. The community comes together for neighbor-run events like block parties, holiday luminaria display and an Easter egg hunt. Metra commuters make the 10 minute walk to the train in the morning and families enjoy walking to town for the weekend Farmer's Market, summer festival and concerts in the park. The neighborhood's namesake, Randall Park, is one of the few Downers Grove parks that offers a shaded spot to play and is a frequent meetup spot for playdates and weekend baseball games. Sound like a fit for you? Ready to pack your bags and move to Randall Park? We have a few properties available to build on in this wonderful location - one is a wide lot set upon a hill, available to purchase and customize at 5344 Benton Ave. We'd love to tell you all about it. If this neighborhood doesn't sound like what you're looking for - drop us a line. We'll match you up with a location perfect for you!